An organization can achieve sustainable excellence if it embraces and respects the environment in the present and cares for the well being of the generations to follow. The concept of creating sustainable future is broadly defined as meeting the needs of the present generation without compromising the ability of future generations to meet their needs. The ability to adapt to change is a crucial element for the survival and the key to success for an organization. The critical issue of the present time is the ability to sustain in the face of rapid global change and resource competition. Everyone including employees and stakeholders are to play a part for creating a sustainable future. Management is to practice transformational stewardship and to find sustainable practices and strategies for the organization to create sustainable future. The principles adopted by the organization creating sustainable future are more holistic than the practices followed in the past. The management is to recognize that both the need for return on investment, the wise use of resources, and seeking the well being of their employees and stakeholders are equally important. The organization creating sustainable future is to utilize appropriate technologies and strategies for securing its future and to benefit its neighborhood. It is to shift towards the practices that respect people, profit and planet to remain not just competitive, but secure in the market. Organization creating sustainable future take managerial decisions which are based not only on financial concerns but also on environmental and social concerns. Such organization (i) creates long term financial value, (ii) knows how its actions affect the environment and actively work to reduce their impacts, (iii) cares about its employees, customers, communities, and other stakeholders and work towards making positive social changes, and (iv) understands that these three aspects are intimately connected to each other. Compared to the organizations that focus on short term profits and make decisions purely on the basis of bottom line, the organization which believes in creating sustainable future thinks long term. It forges strong relationships with employees and members of the society. it finds methods to reduce the consumption of natural resources and the amount of generation of wastes and pollutions. Such organization survives various shocks and upheavals which are normally faced by organizations during their life time. ‘The Natural Step’ was initiated in Europe in the late 1980s and also gained its popularity in several countries outside Europe. This approach highlights the issues such as ‘peak oil’ and global climate change. It emphasizes the diminishing alternatives for sustainability as resource productivity declines and human resource demands increase. It focuses management on protecting and conserving the natural and human resources needed for sustenance. Since late 1990s ‘Triple Bottom Line’ (TBL) management for creating sustainable future has gained in popularity amongst various organizations around the world. TBL approach stresses the importance of ecological and social performance, as well as economic performance, in ensuring the long run sustainability of organizations. The term ‘Social responsibility, is a catch all phrase encompassing a wide variety of management strategies and seems to have become the most popular for organizational sustainability. The transition from industrial to sustainability paradigms of management is not an easy task since productivity and sustainability represent different fundamental purposes for creating and managing organizations. While productivity is dependent on efficiency, which is reflected in principles of profits and growth, sustainability is dependent on both the efficiency and the capacity especially, the capacity to sustain productivity over time, indefinitely. The fundamental purpose of the organization for creating sustainable is permanence which means to meet the needs of the present without compromising the future. Such organization has a unique purpose and a unique set of principles that reflects its unique mission that shares the common core principles of ecological, social, and economic integrity. The organization that does not take seriously issues related with creation of sustainable future are at tremendous risks. In some of the organizations which do take the challenges of sustainability seriously, the social responsibility is more about managing public perceptions than managing realities of sustainability. Such organizations comply with environmental and social regulations since they are forced to, rather than because they choose to, while some others do more than they have to do. A large number of organizations follow integrated strategies. These organizations understand the importance of sustainability, but have not found effective means of addressing it within the current economic environment. The organization that believe in creation of sustainable future, pursues the purpose of sustainability with a passion, and has strong commitment towards building a sustainable society. Top management of many organizations has only shallow support for sustainability and they cling to the industrial philosophy of management and thus continue to manage unsustainable organizations. The management of these organizations see environmental and social responsibility as constraints to organizational profitability, not essentials for organizational sustainability. The organization that believes in creation of sustainable future evolves its processes which accommodate the ecosystems within which the organization exists, rather than having processes which dominates the ecological and social environments. Sustainable development ultimately requires that the organization recognizes and respects the laws of nature, including human nature, that determine sustainability. Sustainability needs that the organization should manage both natural and human resources in the ways that are in harmony with the basic nature of reality. The organization must choose to maintain the integrity of the ecological and social environment upon which its future ultimately depends. The organization believing in creation of sustainable future has a set of standards for individual and collective conduct, which may include both structural and operational core values. The set of principles chosen must be both necessary and sufficient to ensure that the organization fulfills its purpose. If a principle is not necessary for the functioning of the organization, the ability of the organization to adapt to changes in its environment is unnecessarily constrained. The organization that creates sustainable future derives its principles from the principles of ecological, social, and economic integrity. The sustainability of the organization is inevitably linked to the natural ecosystems from which it normally extracts its material resources and within which it disposes its wastes. The first principle of ecology is that ‘everything is interconnected’, and from it the organization derives the guiding principles of ecological integrity which are holism, diversity, and interdependence. The natural environment is not simply a collection of physical and biological elements but it is an interconnected whole within which the organization is an integral part. Anything the organization take from the environment or dump into the environment affects the environment as a whole and thus ultimately affects the long term viability of the organization. The organization that creates sustainable future relates to the natural environment holistically. The organization that creates sustainable future must have the interdependent relationships with its environment since such interdependence is mutually supportive. Relationships between the organization and its natural environment is always mutually beneficial for sustainability. The organization is inherently dependent on the natural environment for its productivity while the health and productivity of the natural environment is dependent the organization since it is using it. If the relationship is not mutually beneficial, neither the productivity of the environment nor the productivity of the organization can be sustained. Management of the sustainable organization should maintain interdependent relationship with the nature. If the people working in the organization are to care about the organization, and be committed to the long run well-being of the organization, they must know that that the organization cares for them. The management which manages the sustainable organization creates and maintains an organizational culture of caring. The integrity (wholeness, completeness, strength, and soundness) of an organization , depends on the extent to which the principles of sustainability permeate all aspects of the organization. The organization dedicated towards creation of sustainable future is more than a collection of individual employees or parts of a machine. In such organization the human resources are allocated efficiently, not only to create economic value but also to create a caring organizational culture since the social integrity depends on ecological and economic integrity. Organization creating sustainable future has the principles of ecological, social, and economic integrity. Sustainable relationship between the organization and the natural environment is derived directly from the principles of social relationship. In using the resources of nature and the natural environment, the management of the organization creating sustainable future should reflect a sense of caring and trust in its relationship with people, including not only the employees and neighbors but also those of future generations. Also the natural resources must be used efficiently, not just to maintain economic value but also to maintain the intrinsic value of living in a clean and healthy natural environment. Ecological integrity depends on social and economic integrity. Management of the organization dedicated to creation of sustainable future is similar to the nurturing of life. It does not consists of manipulation of various mechanisms. If the organization is cared for then it is productive, self-renewing, and regenerative. It develops to accommodate its economic, social, and ecological environment. It is able to meet the needs of the present without compromising the future. The organization dedicated to creation of sustainable future continually renew its natural and social capital in order to sustain its economic capital even in the absence of economic incentives to do so. The social and ecological bottom lines is given a high priority as the economic bottom line in this organization. Top management of the organization dedicated to creation of sustainable future leads the way through the ecological, social, and economic transition. It understands that the old paradigms of science and economics are obsolete and new paradigms are required to be developed if the organization is to have a sustainable future. Very little guidance is available to the management through this uncharted territory except their common sense and their shared sense of what is true, right, and good. The management must have the courage to return to common sense. The advantages of creating a sustainable future is that many of the changes which the organization makes in its organizational practices are beneficial to the health of the organization and its people as well as the environment. These changes also help the organization to cut costs. Reduction in the energy, raw materials and water usage, as well as in production of waste, all translate into less resource utilization and therefore, lower costs. Whether it is a concern with cutting operating costs or reducing the organizational carbon footprint, decrease in the consumption of shrinking stocks of natural resources is a natural choice for the organization. It is necessary not only for the viability of the organization but also for the conservation of the resources. This promotes greater future security and reduces the environmental damages. The following three qualities are most important for the organization to successfully implementing a strategy that create a sustainable future for the organization. The actions taken for creating a sustainable future by the organization contributes to the global effort to reduce the ecologic footprint. Sustainable operation of the organization has three main drivers as given below. Environmental – As the demand for energy and natural resources grow, impacts to ecosystems grow proportionally and cause more damage to the health of the planet and the communities. Economical – Sustainability presents opportunities for efficiency that can improve the organizational performance and competitiveness, while reducing operating costs. Social – Investors, customers, communities, environmental groups and the media have begun to make sustainability the profitable choice. 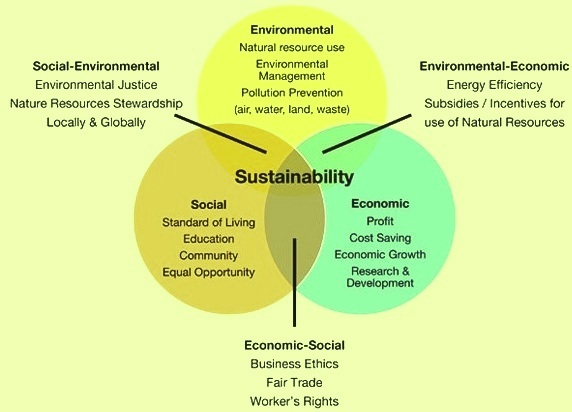 The three drivers of sustainability is shown in Fig 1.